Know yourself (your skills and goals), the job, and the company. Prepare. Present your skills and value first, then back them up with experience. Don’t ramble. Talk only about your most relevant skills and successes. Be ready to explain your next planned career step. Don’t bad mouth former employers; you’ll be seen as likely to repeat the behavior. Answer questions fully and with concrete examples (whenever possible). Show how your life, work, and educational experience can pay off for the employer. Keep focused on the job’s duties. Learn about the employer’s needs. Express enthusiastic and sincere interest in the job. Follow up with a “thank you” letter. What objectives would I be expected to meet? What are the most important skills you are looking for in this position? What are the company’s objectives for the year? What are the biggest hurdles you hope to overcome in the next quarter? What are some of the more challenging aspects of this job? Are positions filled from the outside or is there promotion from within first? What products/services are in the developmental stage? What is the company’s plan for the future? BUSINESS SUIT: Single breasted suit of grey, navy, black or brown is recommended. Sleeves should end at the wrist. SHIRT: Long sleeved, button down, collared white or light blue shirt is acceptable. The collar should fit perfectly and about one inch of the cuff should show beyond the suit. The shirt should be cotton fabric and well ironed. TIES: Conservative stripe or small pattern. Avoid bright colors. SHOES: Black or brown and very well polished. Dress shoes or a conservative loafer is recommended. SOCKS: Solid and dark to match the shoes and pants and high enough to cover the calf. ACCESSORIES: The only jewelry that should be worn is a conservative watch or ring. Avoid facial earrings. A good leather belt to match your shoes may be worn as well. Carry a professional looking portfolio to keep extra resumes, a note pad and pen. GROOMING: Make sure your hair is neat and that you look professional. Do not wear heavy cologne or strong smelling after-shave. Avoid eating strong smelling foods before your interview and make sure your breath is fresh. BUSINESS SUIT (skirt or slacks): Tailored conservative colored suit such as grey, navy, brown or black may be worn. Avoid floral prints. The skirt should be no higher than knee length and no high slit. Be sure that the skirt is not too tight and make sure you are comfortable sitting down. BLOUSE: Business-like blouse that looks neat and is flattering. White or pastels are always professional looking. Make sure that it is freshly pressed and has a conservative neckline. No low cut tops! SHOES: Mid-heel pumps in grey, navy, brown or black. Don't wear light colored shoes, sandals, or very high or narrow heels. Make sure that your shoes are well polished and in good condition. HOSIERY: Neutral colored hose is always safe, but one that blends with your suit color is a great idea as well. No textures or patterns should be worn. Always carry an extra pair with you just in case you spring a run. ACCESSORIES: Wear conservative jewelry and simple style earrings. Avoid big hoops and bangles. Your pocketbook should be in good condition and not too large. A professional-looking briefcase is another option instead of a purse. Carry a sharp looking portfolio to keep extra copies of your resume, a note pad and pen as well. GROOMING: Fingernails should be conservatively manicured and not too long. Hair can be worn tied back or up if very long. Makeup should be moderate and natural looking. Do not wear heavy perfume. Avoid eating strong smelling foods before your interview and make sure your breath is fresh. Many employers prefer to conduct an interview during lunch or dinner. This way, they can observe a candidate’s dining and social skills. Here are a few guidelines that can help you prepare for this type of interview. The most important tip is to understand the table setting. Begin using eating utensils starting from the outside, and work inward toward your main plate. 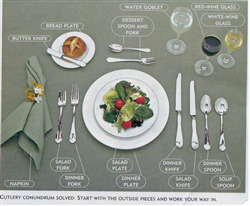 The fork on the left hand side, further from the plate is the salad fork. In the image below, the fork closer to the plate is for the main course and the dinner knife is on the right-hand side, closer to the plate. Dessert spoons and/or forks are above the plate. The bread and butter knife is placed on the upper left hand side. The wine or water glass is on the upper right-hand side. If the glass has a stem hold it from the stem. Napkins are placed on the plate or on the left-hand side. Wait for the interviewer to be seated and unfold his/her napkin first. Then place your napkin on your lap. If you have to excuse yourself from the table during the course of the meal, place the napkin on the chair. It's possible that a server would come by and refold it for you while you have stepped away. At the end of the meal, leave your napkin on the table. As an interview candidate, you should wait for the employer to place his/her order first. Look for an inexpensive item; choose a moderately portioned entree, and something simple to eat. While ordering, remember to use “please” and “thank you” to the server. The employer is looking to see if it is your nature to be polite to a server. Order water, iced tea, or a soft drink. Wait patiently for all at the table to be served their entrees before starting to eat. Once you are finished with your meal, place the knife and fork in the 4 o’clock position on your plate and your napkin on the right-hand side. It is inappropriate to order alcoholic beverage or smoke during a lunch or dinner interview. Q. Is it proper to spread butter on the whole roll or slice of bread? A. You should break the bread into bite-sizes and spread the butter one piece at a time. Q. Should salt and pepper be passed together? A. Yes, salt and pepper should always be passed together even if someone wants only either. Q. Is it ever appropriate to speak with food in your mouth? A. No, you should consume small amounts of food so you can answer the employer relatively quickly. Q. Where can I learn more about proper dining etiquette so I can make sure I have the best possible manners in interview/social situations? A. There are many books and videos available on this topic that provide more in-depth information. Check the University and/or your local library.